We all use Outlook. It’s easy. You can answer email, keep your appointments and your calendar, and save your files in various folders. But are you using it to manage your entire workflow? You can. Presenter Melissa P. Esquibel combines her 25+ years of experience in information technology with a background in training, technical writing and business risk analysis. Her goal is to move beyond email and help you understand Outlook’s amazing workflow benefits. You’ll discover how to get more out of Outlook than you ever dreamed possible. This is your hands-on road map to Outlook that can send your productivity skyrocketing. 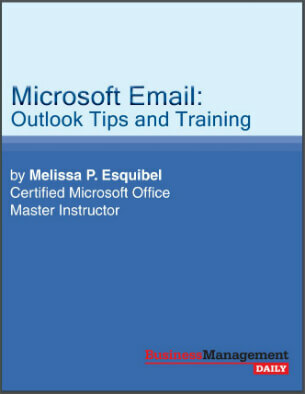 Microsoft Email: Outlook Tips and Training may not change your outlook on life. But it will definitely change your life on Outlook. We’re going to start with a few shortcuts and tips for moving around in Outlook quickly and smoothly. I’m a big fan of the keyboard shortcut. Sure, I use the mouse, too. However, if I can find a keyboard shortcut that lets me keep my hands on the keyboard—instead of taking my eyes off the screen, moving my hand to the mouse, refocusing on the screen, navigating, clicking, repositioning my hand on the keyboard and refocusing on the screen—I’m going to try to incorporate it into the way I work. Most of us don’t even realize how much time we waste using the mouse when we could just stay on the keyboard. Then we’re going to learn an effective way to deal with interruptions, right in Outlook. If you work with Outlook open most of the day, this is a foolproof way to capture the important information that sometimes occurs during an interruption. And, in such a way that it doesn’t significantly interrupt the work you already have in progress. After that, we’ll explore how to tame the mess that is our inbox by using automatic color coding and folder filing in a “set-it and forget-it way” that basically lets Outlook sort our mail for us! Look in the Go drop-down menu. Here is where you can click to navigate to each of Outlook’s components. The other place to look for Outlook shortcuts is in the File drop-down menu, which, by the way, you can get to with Alt-F. Just look at the underlined letters in each drop-down for how to use your Alt key instead of your mouse to access drop-down menus. Another great shortcut is the F9 key. Many of us click with our mouse up to that Send/Receive button during the day to check new mail coming in or to make sure an email we’ve just composed gets out right away. Instead of doing that, just hit the F9 key! You’ll see the exchange happening right before your eyes! Ever have one of those great light bulb thoughts? An idea for a new project or product? My girlfriend in Houston is a songwriter. Every time a great lyric line pops in her head, she grabs a sticky note to write it down. When the muse visits her in the car, by the time she gets home, her steering wheel and dash are dotted with sticky notes she’s written at stoplights and stop signs. Most of us don’t have memories that will sustain a day full of information and activity and still remember that great idea we had first thing this morning when we got into the office. Rather than grab a sticky note, use Outlook Notes. When it’s not hard to record our random thoughts and great ideas, we’re more likely to do it! A less happy time in our day might be interruptions. The Bureau of Labor Statistics reports that interruptions cost U.S. companies almost $6 billion a year. $6 BILLION! Not all interruptions are created equal. The chatty co-worker who drops by to see if we’re free for an after-hours get-together can be politely dismissed with a smile and a “I’ll let you know in a bit, OK?” but the boss dropping by or the client calling us may not be so easily dismissed. Closing down our current task and focusing our attention on the new task costs valuable time, and it’s not always warranted. The most common use for Outlook, of course, is email. Yet few of us know that Outlook can go beyond just being a giant inbox to collect email. It can actually act as a personal assistant to us by sorting and labeling email before we even see it! Some of us have already created folders for different categories of email, such as email from particular people, companies or about certain topics. Another great prep-step Outlook can do is color-code email so that we can easily pick out which emails require our immediate attention, can be forwarded for action by someone else, or which can wait till later to even open. Clearly, Outlook is for more than managing email and appointments. Use it to organize your entire workflow. And learn shortcuts! You will improve both your speed and accuracy in Outlook by learning to use the shortcuts rather than using the mouse all the time.